Even Better Than the Real Thing: A Shanghai Scrap Correction! 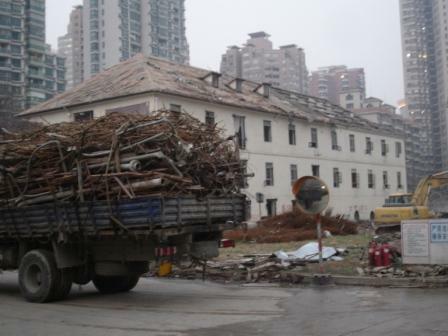 Earlier this week, Shanghai Scrap told you all about the torturous path that Shanghai’s 19th century Carmelite convent has taken, from after-thought on the Shanghai Film Studio lot, to (apparently) a renovated museum at the redeveloped Shanghai Film Centre . The full account can be found here. This afternoon I happened to have lunch with somebody who has knowledge of this project, and this person chuckled when I mentioned how wonderful it was that somebody in Shanghai’s bureaucracy cares enough about the city’s history to save one of its oldest (1874!) buildings. Why the chuckle? “No, no, Adam, they are knocking it down and rebuilding it on the old foundation. It will be a new version of the old convent. It’s much cheaper this way. Restoring it would take too much time and money.” That is to say, the museum/convent shown on the blueprints for the Film Centre is a new building, built to resemble an 1874 building. It is not a renovation or preservation. Below, a photo taken at 5:00 PM, today, of the current state of this “preservation effort.” Note how the roof is disappearing (and yes, that’s scrap from the ongoing demolition/”restoration”). Don’t see any historic buildings there? That’s because the developer, and the city, demolished them (contrast this photo with this City of Shanghai press release touting the Jianyeli project). I’m in no position to judge whether or not this is a correct interpretation of the preservation situation in Shanghai. But one thing I do know: the architect in charge of the rebuilding of the 1874 Carmelite convent is WWCOT, a Santa Monica, California-based architectural firm. This afternoon I requested information from the firm in regard to this “restoration,” and I’m currently awaiting an answer. Stay tuned. In the meantime: apologies to my readers for rushing to post too early on this complicated demolition/renovation. This entry was posted in Architecture, Catholicism, Snarkiness by Adam. Bookmark the permalink. Nice to see a blogger run a correction but I really don’t think this case really deserves it. This is followup not a correction I think. It is almost certainly true that it will be much cheaper to build a replacement than to retrofit the original, but I suppose it is an interesting cultural and philosophical question how much difference it makes if the stones are not original. Would it be OK if they were to mimic the construction techniques and craftsmanship of the original structure? Would it be OK for them to throw up a crappy ‘placeholder’ fake version and go back and replace it with a more authentic, higher quality one in 20-30 years? Western, especially American, attitudes toward historical preservation border on the fetishistic, so it isn’t altogether surprising that the Chinese have mixed feelings about preserving symbols of Western heritage in China. As a Westerner I’m always a little grateful when Chinese city planners set aside some of our colonial relics for preservation, fake or not. Maybe the planners are using the 80/20 rule–80% of the cultural and symbolic impact for 20% of the effort (expense) of a full restoration. Joe – That’s a good comment. In return, a couple of quick responses. First, you’re right about the American preservation fetish. I swear, if they could, New York’s heritage preservation fanatics would write up covenants for each of the individual cobblestones in the meatpacking district. Only half-joking, here. So why is the convent worth preserving? First, it was built in 1874, and thus it is one of the oldest structures in all of Shanghai. The building materials – especially the wood beams – are simply not available any more (and that’s part of the reason why I saw them being carted away). Until there are old growth forests like those from which the beams and floors were built, there can’t be another like it. And sadly, Chinese building technology and techniques have not evolved for the better over the last 20 years. The old concent lasted 135 years; I’d be genuinely surprised if the new one made it fifteen. But more important is the fact that the convent – and all of Xujiahui’s remaining colonial church buildings – are artifacts that speak to the extraordinary influence that the Church had on Shanghai in the 19th century (an influence that Shanghai has not turned its back on). It is no exaggeration to write that some of Shanghai’s most important civil institutions have their origins in the Catholic Church, including Fudan University, the city library, the Meteorological Bureau, and the astronomical observatory. I won’t go into the 17th century origins of Shanghai Catholicism, here, but suffice it to say that had there not been a Catholic Church in Shanghai, this city wouldn’t have become the intellectural crossroads between East and West that it was for three centuries (and sort of is, today). 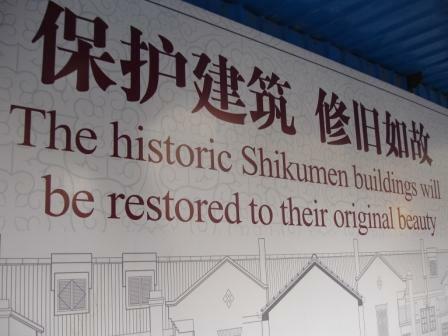 The city of Shanghai has begun to recognize this, and has taken steps to preserve that heritage in other places. And that’s what makes the destruction of the convent so pitiful – the only reason to do so, as far as I can see, is commercial considerations. 20 years from now, I suspect, the Shanghainese will look upon its destruction, and the destruction of other historic structures, with the same sad sighs that we reserve for the excesses of the US “urban renewal” movements of the 60s and 70s. I’ll have to come back and read through your info. It looks very interesting. Adam, I don’t know if you’ll ever have a reason to visit Yantai, but speaking of historical preservation they have a waterfront restoration of colonial buildings that is ‘better than the Bund’ in some respects. (Ironically, they tore down most of the neighborhood my wife grew up in as part of the preservation effort.) I don’t know what the ratio of preservation to reconstruction is, but the buildings look convincing enough from the outside. There is also a small church/chapel in the area that seems to be in limbo between preservation and neglect, and I’ve often wondered what the plan is for that structure. I had my bubble burst with this one at Long Hua Temple. When I first got here in 2001 I was working a lot and was a bit disoriented. I went to Long Hua Temple one weekend and loved it, seemed so peaceful in there. It became a bi-weekly chill out. Reading the literature, I believed it was an original on the original site. This was a bit silly of me in the first place, considering the supposed time it was built. 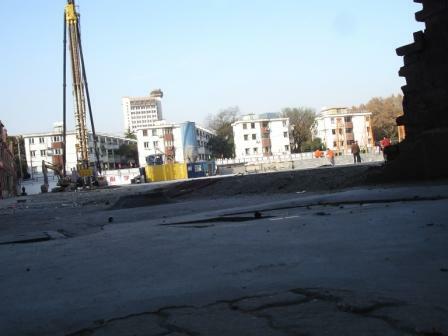 But anyway, one day I went there and saw it was under construction. My initial beef was that they charged the normal price and yet half the area was out of bounds. Of the next three visits here is what I saw. Hall by hall, a team of around 12 guys with mallets knocked everything down into rubble, by hand. Then, a brand new one with the same design was built in place. Having thought about it, it couldn’t have been the original before, but here’s the punch line. Through researching J G Ballard’s works and looking for some sites a couple of years later, I found that the original pagoda site was 2kms south anyway. The camp, which was by the original pagoda, is now Shanghai Zhongxue. There are online photos available showing the clearly different design of the original too. Now, not everyone has a ruins fetish like the UK (preserving ruins = good, I think). Japan rebuilt their castles as the old one’s were burnt down in the Meiji revolution. But they say so. What annoys me is the travel lit and site info that flat out lies. When there is a beautiful old building existing that can be preserved and it gets knocked down and rebuilt, that’s a loss so I agree with the post. Sorry about the rambling disconnected comment, the narrow field of entry means that I can’t easily get a sense of what I wrote before. Andy – That’s a great example of what we’re talking about here. Thanks for bringing it up. Like so many of the buildings that have been preserved along these lines, the tour books (Lonely Planet, etc) continue to write up Long Hua as the real thing. Drives me crazy.